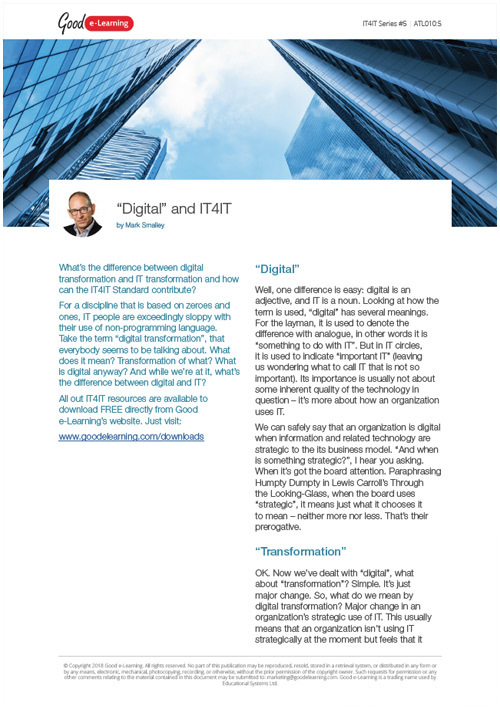 What’s the difference between digital transformation and IT transformation and how can the IT4IT Standard contribute? For a discipline that is based on zeroes and ones, IT people are exceedingly sloppy with their use of non-programming language. Take the term "digital transformation", that everybody seems to be talking about. What does it mean? Transformation of what? What is digital anyway? And while we’re at it, what’s the difference between digital and IT? If this IT4IT resource interests you, why not view our IT4IT Foundation course. Or view our full library of downloads covering a wide range of subjects and domains!